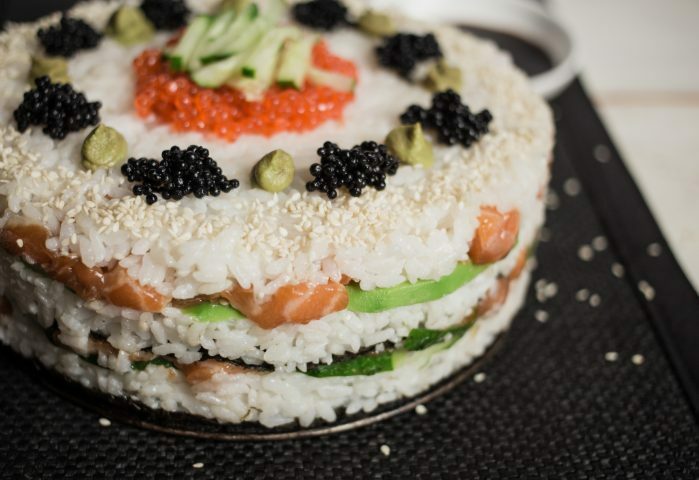 A catering company created a delicious sushi cake. A very special gift to do for a special person. Kouen Sushi Bar, a catering company in Bangkok, Thailand introduced a heart-shaped cake that is basically a giant piece of sushi. 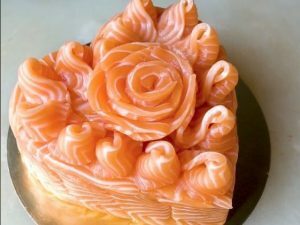 The ‘Salmon in Love' cake is made completely out of salmon sashimi on the exterior, filled with rice on the interior, and topped off with fish eggs. Ingredients: 4 cups cooked sushi rice; 4 sheets nori; 500 g (1 pound) fresh salmon, skin and bones removed; 1 avocado, sliced; ½ cucumber, sliced; 1 tbsp sesame seeds; 11 tbsp sesame oil; 2 tbsp soy sauce; caviar, wasabi paste, nori, cucumber for serving. 1) Slice salmon fillet into large cubes. Add soy, oil and sesame seed and mix to combine. 2) Place 2 nori sheets on the bottom of the round spring form. 3) Add 1/3 of sushi rice, cover it with a layer of salmon and cucumber sliced. Add a sheet of nori, another layer of sushi rice, a layer of avocado and salmon. 4) Top with leftover rice and place in a fridge for 30 minutes. 5) Remove from the form and decorate with caviar, wasabi, cucumber slices and sesame seeds. 3 ingenious ways to make great sushi!